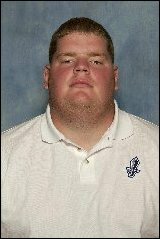 Justin Bland - OT - A three sport All-State athlete for Chillicothe High School, Justin Bland was a starting Offensive Lineman, Defensive Lineman, Kicker and Punter, earning First Team All-State honors at Offensive Tackle in 1996 and 1997. He guided the Hornets Basketball team to final four appearances his Sophomore, Junior and Senior years, taking Second Place his Junior and Senior years. Bland earned First Team All-State honors as a Center in basketball and was a McDonald's All American candidate his Senior year. He also was a State Track Medalist in the Shot Put and Discus. In college, Bland was a four year letterman at the University of Missouri. The 6' 6" 345 pound Offensive Tackle lettered for the Tigers in 1998, 1999, 2000 and 2001. He started 33 straight games for the Tigers as a Sophomore, Junior and Senior, earning all Big-12 Conference Honorable Mention in 2000 and 2001.
the Scottish Claymores. Bland left football at the end of the NFL Europe season. Jeff Marriott - DT - 6' 5" Jeff Marriott was a three sport athlete for Chillicothe, earning All-State First Team honors at Defensive Lineman in Football, a State Medalist in Wrestling and a State Track Medalist in the Discus his Senior year. Marriott earned his first start as a Defensive End midway through his Sophomore year and started at Offensive Tackle and Defensive End his Junior and Senior years, including the Hornets controversial Show-Me Bowl loss to St Francis Borgia in 1993.
returned 70 yards for a score. His defensive effort helped Missouri beat the Marc Bulger led West Virginia 34-31 to earn him Defensive MVP honors for the game. Marriot was drafted by New England in the 5th round of the 2000 NFL Draft as the 161st overall pick. After being cut, Marriott spent time with Jacksonville, St Louis and Carolina. 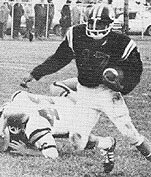 Ardell Johnson - DB - Ardell Johnson helped guide the Hornets to their first Football State Championship in 1970 as an All-State Defensive Back and All-State Honorable Mention Running Back. Johnson was a starter at both positions his Junior and Senior years plus a starter on the Hornets Basketball team and was the first Hornet Track star to run a 10.0 100-yard dash. regular season, he had two interceptions and three fumble recoveries, earning Defensive Player of the Week honors once, then capped his College career with an interception at the end of Nebraska's Sugar Bowl victory over Florida. He also led the team in pass breakups his Senior year. The teams in which Johnson played on from Junior High School through College combined for a record of 69-7-3. Johnson was drafted by Coach George Allen and the Washington Redskins in the 11th round of the 1975 NFL Draft, however he did not make the final roster. Johnson returned to academics and graduated from the University of Santa Clara Law School in 1980. He is a partner in a San Jose, California Law Firm. 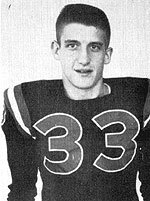 John "Butch" Davis - DB - Arguably the best football player in Chillicothe history, Butch Davis was a first team All-State Running Back in 1964 and 1965, when teams failed to recognize defensive players. Davis became a starting running back in the seventh game of the 1963 season and went on to be a force for the next two and a half seasons. Davis was known as a threat to score on either side of the ball with 5 interceptions returned for touchdowns and a total of 46 touchdowns in his career. In his All-American Senior season, Davis led the state in scoring with 192 points. The 5' 11" 180lbs Davis signed to play Defensive Back for Missouri Coach Dan Devine. In Davis' first college start against S.M.U. the first game of his Sophomore year, he returned an interception 53 yards for a touchdown. He went on to start for three years and played alongside future NFL Hall of Fame Defensive Back Roger Wehrle his Sophomore and Junior years. Davis was an All Conference Second Team selection his Senior year and was selected to play in the College All-Star Senior Bowl. A talented all around athlete, Davis also played Baseball for the Tigers as a Sophomore and Junior. Davis was selected in the 12th of 17 rounds of the 1970 NFL Draft by the Chicago Bears as the 287th overall selection. Davis sustained a foot injury in a preseason game against the St Louis Cardinals and was placed in the injured list. Once healthy, the Bears sent him to the "taxi squad". Davis' big chance came on October 16th, 1970 when he was called up to fill in for an injured player. Davis started against San Diego two days later and played in 11 games. His only interception came in the final game of the season against the New Orleans Saints. In 1972, Davis was reunited with his college coach Dan Devine and the Green Bay Packers but was again relegated to the taxi squad before an injury ended his playing days. 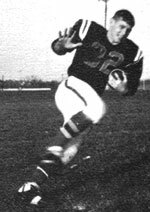 Vince Turner - DB - Turner was another three sport star for Chillicothe in the late 1950s, earning All-State Honorable Mention honors at Running Back in 1959. (There were no defensive All-State players at this time). Turner was a leader in the Defensive Secondary plus started at right halfback his Junior and Senior years. He was a starter on Chillicothe's1959-1960 State Quarterfinal basketball team plus a premier hurdler in Track. backfield his Senior year but an ankle injury kept him out for the first three games. Once healthy, Turner returned to his defensive spot. In the annual rivalry game with Kansas that season, Turner picked up a fumble and returned it 103 yards for a touchdown, a Missouri school record that stands to this day. Turner was selected in the 9th round of the 1964 NFL Draft as the 120th overall pick by the Baltimore Colts. After being released in training camp, Coach Weeb Ewbank picked him up for his New York Jets team. Turner played in six games in 1964 at Defensive Right safety, making one interception and returned two punts and one kick off for the 5-8-1 New York team. Turner was dropped by the team in August 1965 and returned to graduate studies at the University of Missouri. James "Junior" Darr - Offensive Back - Junior Darr was a star for the Hornets in the late 1930s, playing Quarterback for one game as a Freshman in 1936, then starting running back in 1937, 1938 and 1939 when he was selected to play in a North-South high school All-Star game his Senior year. He was also a member of the basketball team and a member of the 1939 Hornets State Champion Track team as a Junior and on the State Champion 880-yard relay team his Senior year. Darr was also known as a deadly softball pitcher with a lightening fastball that led three teams to summer state championships. Darr headed to the University of Missouri to play football for Coach Don Faurot. He played at Running Back and Quarterback on the Tigers Conference Champion teams of 1941 and 1942, lettering in 1942. While in college, Darr joined the Marine Reserves and was called up and sent to Purdue University for training. While there, Darr made the most of the opportunity, playing Quarterback for Purdue's 1943 Big Ten Championship team. 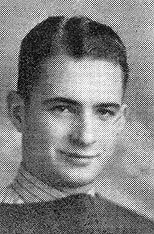 Darr served his country during World War Two and after two years out of the sport, he elected to return to the Missouri Football Team instead of Purdue for his senior year in 1946. Darr went un-drafted but in April 1947 signed to play for the Baltimore Colts of the All American League. He suffered an injury in the preseason and by the fall of 1947 had taken a teaching and assistant coaching position at Sedalia Smith-Cotton High School.